East Valley Children's Choir (a.k.a. EVCC) is a community outreach ministry of Evangelical Formosan Church of East Valley (EFC-EV). 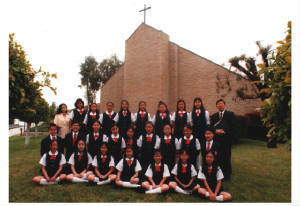 It's a Christ-centered educational organization serving the communities in east San Gabriel Valley, California. Its mission is to provide a nurturing environment for the local community’s children to learn music, to explore their musical talents and to enjoy the musical arts in a choir setting. An equally important role of EVCC is to encourage the growth of self-discipline, responsibility, teamwork, and self-confidence.